In fact, I should ask all of you, my favorite home cooks: what’s your favorite little-work-big-reward recipe? Baked Fish and Potatoes in a Saffron-Tomato Broth: Thinly slice two big potatoes. (I used Yukon Golds and my cheapo mandoline, but you can also slice your potatoes as thinly as possible by hand.) Drizzle/rub them with olive oil and a pinch of salt, then spread them out in a 9×13 pan. Put them in the oven at 425 for 15 minutes. While the potatoes are cooking, saute two thinly-sliced onions in olive oil over medium-high heat with a pinch of salt. When they begin to brown, add two minced cloves of garlic and cook for an additional minute. Then add 2 c. vegetable broth, 1 Tbsp. tomato paste, a good pinch of saffron threads, another and a few dried hot chiles. Bring a boil, then reduce heat to a simmer and season to taste with additional salt if needed (especially if your broth is unsalted). When the potatoes have been baking for 15 minutes, remove them from the oven. 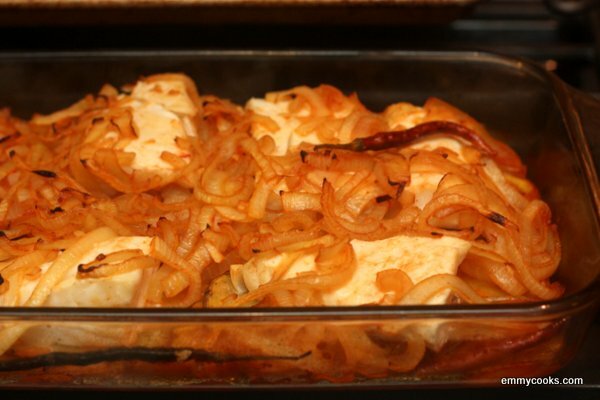 Spread 4-6 white fish fillets (I like cod or halibut) out on the potatoes, then top with the sauce. Return the pan to the oven and bake for another 10 minutes or so, or until the fish is just cooked through and flakes easily when you test it with a knife. Wonderfully simple dish. Look at Elizabeth David’s Salmon in Loire wine. You can see it my book “Eating at La Moussiere” on this link – http://www.blurb.com/books/2001198 – you can preview the whole book. As for my favorite little work big reward recipe, I know so many that it’s hard to pick. The first thing that comes to mind is hot-smoked salmon or scallops. drooling. one of my favorite combos ever. further proof we are destined to eat together some day! Oh, there are so many high-reward recipes! How about the big one: chicken broth. Yes, it’s a component as opposed to a full dish (well, depending…) but that component makes Everything else so good. I also have to say that straight-up seared fish is one of my favorites. Maybe with some green beans sauteed in olive oil with garlic. This sounds seriously good! I’m going to pin it to my “Culinary Bucket List” board! You’re right; some of the best food is the easiest. For instance, I like to make a kicked-up version of pasta alla olio with garlic, red chile peppers, lime zest and a bit of lime juice. With freshly ground pepper and parmesan of course. A delicious and quick dinner! Looks like you and me both have fish as little work, big rewards dishes! I do this salmon en papillote. Salmon on a bed of thinly sliced fingerling potatoes, sliced fennel, and sliced Kalamata olives. I have to give this a try! Yum! Do you put in anything saucy, or just let it steam? I love saffron and tomatoes together. I bet this is delish!